You can’t hit the gym without breaking a good sweat. All those pools of sweat call for a quality gym towel to keep you dry and wipe up sweat from gym equipment. If you run a fitness facility, you may focus on things like choosing the best gym equipment, but finding a quality sports sweat towels can make a big difference, too. 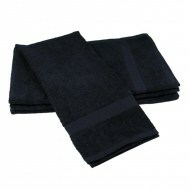 Think of soft, durable gym sweat towels as that special touch that gets your patrons talking. 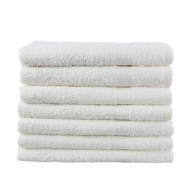 Large size Bath Towels 27x54 (14Lbs/doz) in premium grade optical white extra soft. Gyms can be dirty, sweaty, smelly places — and that calls for good, quality towels. Gym towels offer specific features that make them well-suited for the job of mopping up all that sweat and keeping germs from spreading. Size — Gym towels are small enough to easily manage and carry around the gym, yet large enough to be effective in soaking up sweat. You can choose from different sizes, depending on preference and need at your fitness facility. Larger towels fit other needs around the gym, like drying off after swimming or showering. Quality material — The durable construction of gym towels helps them withstand workout after workout, plus washing between uses. That durability keeps the towels looking great without needing to be frequently replaced. Absorbency — Our gym towels soak up sweat quickly and efficiently, so users stay drier with less sweat on the machines. They also dry quickly, so they can keep up with sweat from lengthy workouts with no problem. Easy maintenance — Gym towels are made with durable materials, which allow them to stand up to frequent washing. You can toss them in the washing machine with a little detergent and end up with fresh, clean towels. Fast drying — The material used in gym towels is designed to dry quickly. That means the towels don’t stay wet and soggy. Quick-drying materials also reduce the change of mildew growth. What Is the Importance of Using Quality Gym Towels? Why should you bother stocking up on quality gym towels? They seem like a minor thing compared to your gym equipment, class schedule and gym design, but it’s often the little things that make the strongest impressions on your patrons. Convenience — By stocking gym towels for your clients, you offer a convenient service that makes your facility stand out. It’s an extra little perk people will notice. That convenience factor means your clients have one less thing to remember when heading to the gym. Cleanliness — Gym towels not only help gym patrons stay dry, but they also help clean up the sweat from the machines. By wiping the sweat off themselves, patrons drip less sweat on the floors and equipment. Providing quality gym towels can help keep the gym a little cleaner overall. Sanitation — With so many people touching the equipment every day, the gym becomes a very germy place. Gym towels can limit the spread of those germs. Instead of wiping off sweat with germ-covered hands, patrons can use the towels. Gym visitors can also put towels down on equipment to create a barrier between the germy surfaces and their bodies. Comfort — Soft material makes towel use comfortable. Gym guests feel like the soft gym towels are a bit of a luxury. It’s a nice added touch that appeals to your clients. Cooling — A towel at the gym can help users feel cooler and more comfortable by wiping off the uncomfortable dripping sweat from their skin. Image — Quality gym towels that look great and hold up well help boost your company’s image. By investing in high-quality towels, you minimize fraying, staining and other damage that makes the towels look outdated. 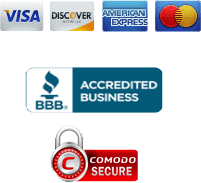 What Are the Benefits of Buying Wholesale Gym Towels? Large quantities — You can easily buy the large quantities you need based on the size of your facility. 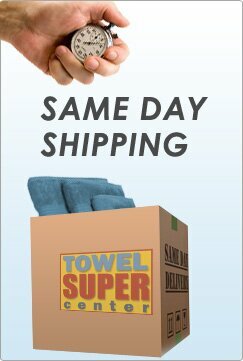 You are more likely to find enough of one type of towel when buying wholesale than you would at a retail store. Lower prices — When you buy gym towels on a wholesale basis, you get lower prices on the towels. 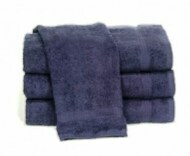 Wholesale purchasing usually means you get lower prices per towel the more towels you buy. If you’re restocking your entire gym, you can get a much lower price per towel than you would at a retail store. Versatile options — Wholesale gym towels come in a variety of options to match what you want and need. You can buy one type of towel or buy smaller quantities of different types of towels. 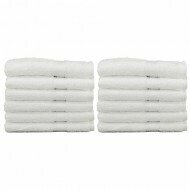 You might buy small gym hand towels for use on the machines and larger towels for pool and shower use. 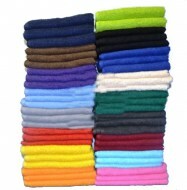 You can also color-code towels for different areas by buying multiple towel colors in bulk. 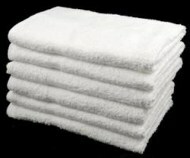 A towel seems like a simple item, but there are several characteristics of towels that differentiate an average towel from an exceptional one. Understanding the different aspects of towels helps you identify quality options for your gym. Material: The material used to make the towel affects how well it absorbs sweat and how it feels on the skin. Two common options are cotton and microfiber. Each material offers several benefits that make them suitable for gym use. 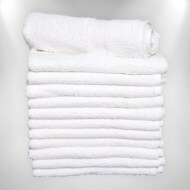 Cotton towels are the most common. They absorb well, feel soft and are readily available. You can wash the cotton towels repeatedly without them showing wear. A variation is a cotton-polyester blend, which capitalizes on the benefits of both materials. The addition of polyester makes the towels more flexible and stretchy to minimize ripping. Microfiber towels are also very absorbent. They are very fast-drying, which helps them soak up more sweat before they feel totally saturated. The fine fibers make the towels lightweight for easier carrying and comfortable use. They also fold up well, so they don’t take up much space in your gym bag. Size: Gym towels come in a variety of sizes to match different purposes around the facility. Small washcloths and hand towels are ideal for wiping up small amounts of sweat. They’re also easy to manage. 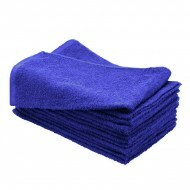 Larger bath-sized gym towels are ideal for locker rooms and pool areas. Bleach resistance: Another feature that’s beneficial for gym towels is bleach resistance. Some towels are designed to be color-safe, even when you use bleach in the wash cycle. If you’re stocking towels for public use at a fitness facility, you know how important it is to thoroughly clean and disinfect those towels after every use. Bleach is a good way to do that. By choosing bleach-resistant towels, you can enjoy colorful fabrics and still use bleach to keep bacteria to a minimum. 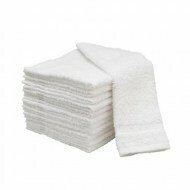 Absorbency: The absorbency of the towel affects how well it works for gym users. In general, towels with a lower GSM, or grams per square meter, are thinner and less absorbent. A higher GSM means the towel is thicker and more absorbent. The benefit of a thinner towel with a lower GSM is that it’s easier to fold, manipulate and store, and they dry faster. Balancing the GSM to make the towels manageable, yet absorbent, provides the best of both. One of the major goals of gym towels is to minimize the spread of germs and sweat. Because towels often serve as a barrier for those germs and contaminants, it’s essential to wash towels after every use. Otherwise, they just continue spreading nasty germs from user to user, which is not only gross, but risky. Reusing a gym towel even once can spread the germs you’re trying to minimize. Plus, gym towels get very smelly with all the sweat that soaks into them. Washing keeps them smelling fresh and clean, so using the towels is a pleasant experience. Have a designated area for dirty towels — When you provide athletic towels for your gym patrons, it’s important to keep those sweat towels clean and sanitary. Set up bins for the used sweat towels, so gym users can easily deposit them when they’re done. This setup allows you to ensure you are washing all the gym sweat towels after every use. Empty the bins frequently, and wash the athletic towels right away instead of letting them sit for extended periods. Damp towels that sit unwashed can grow bacteria and cause a musty smell. Wash in smaller loads — When you have so many sweat towels to wash, it’s tempting to shove as many in the washing machine as possible. Smaller loads are better because they allow the gym towels to get clean. Overloading the machine with athletic towels can also compact the towel fibers, so they become matted and stiff instead of fluffy and soft. Avoid using too much detergent — You want the towels to be clean, but too much detergent can cause issues. It’s tough to wash out the excess detergent. Guests rub the towels on their faces, which may cause skin irritation if they’re full of detergent. The buildup of detergent can also affect the towels’ absorbency, so they aren’t as effective. Add bleach if needed — If you use white or bleach-resistant towels, add bleach to your load only if needed. 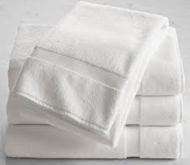 Skip fabric softeners — Fabric softener makes your gym towels less effective because it interferes with absorbency. Don’t add fabric softener to the wash or dryer sheets to the drying cycle if you want to maximize absorbency. Use baking soda — Add a little baking soda each time you wash to help remove odors, which are common on gym sweat towels. The baking soda also helps loosen the fibers to keep them soft, fluffy and fresh. Use vinegar — Another common household item that keeps gym towels in good condition is vinegar. Add a cup of white vinegar to your gym sweat towel laundry once per month. It improves absorbency and gets rid of excess detergent and odors to keep the towels fresh and extra clean. Dry towels thoroughly — Drying exercise towels thoroughly helps prevent bacterial growth and musty smells. Check the athletic towels during the drying cycle, so they don’t stay in longer than necessary. Towel Super Center offers a huge selection of exercise towels to match your needs. Choose all one type, or mix and match the type of sports sweat towels you purchase for different areas of the facility. No matter what type you choose, you’ll get lasting exercise towels made of quality materials that look and feel great. Microfiber — Stock the gym with lightweight, absorbent microfiber towels. They dry quickly, so the washing process is faster than other towel types. Cotton — Choose traditional 100 percent cotton towels for softness and absorbency, with the durability to last through multiple washings. 86/14 blend — Get the best of both worlds with a blend of 86 percent cotton and 14 percent polyester. 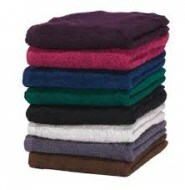 The towels are soft, durable and stain-resistant. Bleach-resistant — Keep your gym shower towels looking great without sweat and dirt stains with bleach-resistant towels. You can use bleach to clean and disinfect the towels for safe use without bleach marks. Economy — When you’re looking for a balance between price and durability, economy gym shower towels are a good option. These towels last, and the price matches any budget. Premium — Treat your gym patrons to premium towels for a luxurious experience. Just like the economy towels, these options are absorbent and durable. Premium plus — Take your towel selection a step further with premium plus towels. These gym towels stay ultra-soft and fluffy, even with repeated washing. 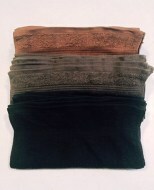 Washcloths — These small cloths work well for dabbing up small amounts of sweat. They’re easy to handle for quick workouts or wiping sweat off machines after workouts. Washcloths typically measure 13 inches square. Hand towels — If you want a little more surface area for soaking up sweat or covering the seat on a piece of equipment, opt for hand towels. These towels typically measure 15 inches by 25 inches or 16 inches by 27 inches. Keep these towels handy in workout areas for your clients to grab. Bath towels — Larger bath-sized towels come in handy in gyms with pools. You can also offer them in the locker rooms for gym users who want to take showers after workouts. Bath towels can range from 22 inches by 44 inches to 27 inches by 54 inches or larger. Color is also an option, with a rainbow of hues available from Towel Super Center. Classic white is a versatile option that works with any gym décor, and white towels are easy to wash and maintain. If you prefer a little color, we have many options available, from bright colors to dark, versatile black. Towels with a single stripe down the middle make your gym towels easy to recognize, so you can keep track of your investment easily. The distinct look lets you know which towels belong to your facility. Buy all one color that coordinates with your gym branding, or use different colors for different purposes to easily keep track of your towels. You might put one color in the weightlifting area, another in the machine area and another in the pool area. This system makes sorting and restocking easy after you wash the towels. 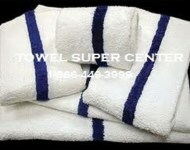 Towel Super Center offers a plethora of options for you to treat your gym's patrons with. Whether you need small sweat towels for the gym, gym shower towels, or sports bath towels, we have it all. Believe it or not, the quality of a gym's exercise towels can make a big difference in customer loyalty and retention. 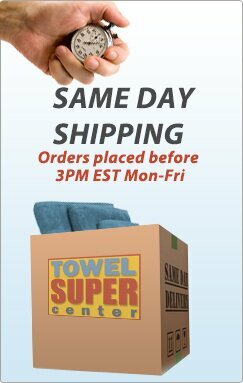 Keep your customers satisfied by buying high quality, cheap sports towels at Towel Super Center! Treat your gym patrons to soft, durable gym towels while keeping your gym equipment a little less sweaty. Towel Super Center delivers on quality materials, versatile options and price, so you can fulfill all your gym towel needs within your budget. Shop our selection of gym towels now.